Balai B+B, 53 Burgos St; +63 78 844 5283. Its strategic location at the heart of the city means that it’s minutes away from the local market, church and various restaurants. Hotel Lorita, Rizal St; +63 78 846 2565. This simple but modern hotel is a mere two-minute walk away from St. Peter’s Cathedral. Hotel Roma, Bonifacio St; +63 78 844 1057. An economy hotel with spacious and comfortable rooms, and free WiFi. Ivory Hotel and Suites, Buntun Highway; +63 78 844 1275. A family-friendly hotel with a sizeable swimming pool. Located a mere 15 minutes from the bus terminal and the Tuguegarao domestic airport. Billy Jack’s Panciteria, Buntun. Sample pancit batil patung (noodles with minced beef), the restaurant’s specialty dish. Corazon Cadatal Meat Products, +63 927 772 6600. Try the longganisa (pork sausage), which has an addictive garlicky flavour. It’s best served with warm rice and spiced pinakurat vinegar. Fat Kid Inside, Maharlika Highway, Pengue Ruyu; +63 917 896 8737. Order the restaurant’s famous Fat Kid burger, which is loaded with spam, crispy honey bacon bits, homemade aioli and more. Jeff’s Panciteria, #70 Caggay Highway; +63 935 144 2696; facebook.com/JeffsPanciteria. Another restaurant that serves up pansit batil patung that’s pretty darn good. Jomar’s Panciteria, Diosdado Macapagal Ave. Ask any local in Tuguegarao City where the best pancit batil paton is, and they will inevitably point you towards this popular restaurant. Kusina Cagayana, Pan-Philippine Highway; +63 917 585 9288. Fill your tummy with a buffet lunch of mouthwatering Cagayan dishes and other Filipino fare. Lavinia’s Secret Recipe, #1 Lighthouse Building, Luna St; +63 78 396 1677. For a filling and fulfilling meal, go for the Juicy Lucy, a humongous half-pound beef burger. Local – Kanan + Pasalubong, Airport Rd. An excellent place for Ibanag cuisine. Order the sinanta (noodle soup) and pinakfu (sugar-coated and fried rice flour cake). The restaurant also sells local goods like Kalinga coffee and Guita body oil. Luna StrEat Food Park, 19th A Luna St corner Burgos St; facebook.com/LunaStreatFoodPark. Find a variety of food options, from pares to Cubano sandwiches and churros, at this popular foodie hangout. Tagums Pansiteria, Zamora St; +63 917 535 0352. Besides the local specialty, pancit batil patung, you can also sample seasonal exotic delicacies like beetle larvae and ants’ eggs. Basilica Minore of Our Lady of Piat, Piat. 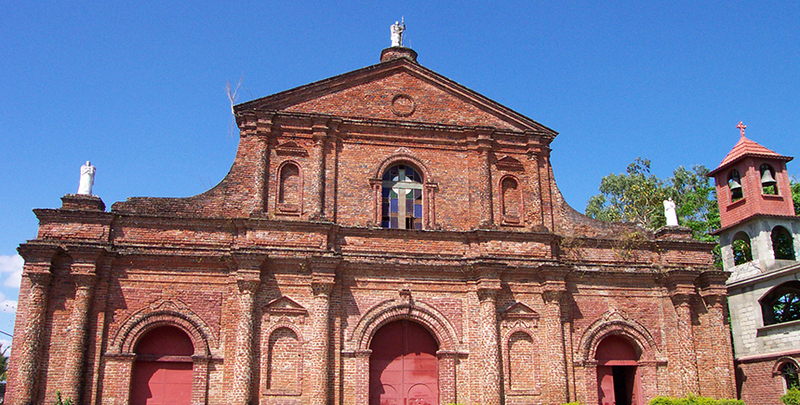 A historical red-brick church housing a 400-year-old image of Our Lady of Piat, one of the most venerated images of Mary in the Philippines. Buntun Bridge. At 1098km, this is the longest river bridge in the Philippines. Just 10 minutes from the city center via tricycle, it’s a great place to take photos with the Cagayan River as the backdrop. Cagayan Museum and Historical Research Center, Expo Building, National Highway, Provincial Capitol Compound; +63 78 846 7337. A simple museum that houses fossils, pottery products and other intriguing artefacts. Callao Caves, Peñablanca. Located a 15-minute drive from the city, these fascinating limestone caves contain seven chambers, and are a top attraction in the Peñablanca Protected Landscape and Seascape (a protected biodiversity area). You might even get to see a bat colony leaving the caves if you stick around at dusk. Lapi Falls, Peñablanca. Nature lovers should take a two-hour bus ride to Lagum to check out this beautiful waterfall. Palaui Island. Take a day trip and go trekking on this hidden gem of an island, which is a 30-minute boat ride from Tuguegarao. Pinacanauan River. One of the largest tributaries of the Cagayan River. It is also a popular site for kayaking, white water rafting, boating and swimming. Ride a kalesa. Go around town on a colorful kalesa (traditional horse-drawn carriage), which plies the roads alongside motor vehicles. You can rent one for half a day, or a full day. Ruins of the Old San Jacinto de Polonia Church, Camalaniugan. Admire the remains of the old church, which was destroyed by a typhoon and earthquake in 1845. The church stands in the middle of a public park, which is popular among locals. The Saint Peter Metropolitan Cathedral, Brgy Centro 10, Rizal St. Built by Dominican friars in the 18th century, this cathedral is one of the largest churches in Cagayan Valley. Quiz: Which Philippine destination should you visit next?